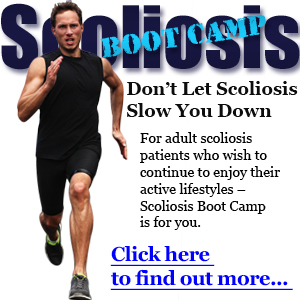 You are here: Home / What Is Scoliosis? Scoliosis is a condition in which an individual’s spine has lateral, or side to side curvature. On an x-ray, scoliosis curves can often look like a simple “S” or a “C” shape. Scoliosis curves can actually occur at many levels of the spine; the cervical/neck region, thoracic/rib region and lumbar/low back region. As well as, also occurring at multiple regions in the same individual. Some patterns of scoliosis curves are more common than others, but hardly ever are two patients’ spines identical. Idiopathic scoliosis is classified into subcategories – infantile, juvenile, adolescent, or adult, depending on when onset the onset of scoliosis occurs. Congenital – caused by vertebral anomalies that occur during embryological development and may be accompanied by other organ anomalies. Neuromuscular – where scoliosis is a secondary symptom of another condition such as muscular dystrophy, cerebral palsy and others. Scoliosis curve is less than 25°. May have tilted head, uneven shoulders or hips. May have uneven leg lengths (with patient laying straight on the floor or bed, observe where the shoes meet). May go unnoticed, even by medical doctors or school screeners. May or may not be associated with pain. Most common in young, premenstrual girls, but can be seen in boys or adults. Easy to overcome when the curve is small. Cosmetic deformity is a much greater concern at this stage. The CLEAR™ methodology offers the only mild scoliosis treatment program available today. CLEAR’s program is non-invasive, pro-active and is specifically designed to address the treatment needs of patients with a developing scoliosis condition. The CLEAR™ program has corrected thousands of mild scoliosis curves. Enrolling your son or daughter in our mild scoliosis treatment program will provide them with the best opportunity to reduce and stabilize their spinal curve before it progresses. Speak to one of our team members at 305-705-0777 to learn more about mild scoliosis treatment options and schedule your initial consultation. For moderate scoliosis curves, bracing is still the most common treatment method recommended. While many doctors in the US still recommend a soft or rigid brace to halt the curve progression, recent scientific studies question the effectiveness of this practice. In some cases, the forced correction of a brace actually causes an increase in patient’s rib deformity, commonly known as a rib hump. Even if a brace is successful and does not increase deformity, all benefit is lost once the brace is removed. Overall, a 2007 article for the journal, Spine, graded bracing as a “D” for ability to halt curve progression. Both patients and researchers agree that we need a better system. The CLEAR™ program is developed as a safe, effective alternate to bracing. The moderate scoliosis protocol is well tolerated by virtually all patients regardless of age, and not only can it stabilize the scoliosis but achieve considerable scoliosis reduction as well. Speak to one of our Team Members at 305-705-0777 to learn more about moderate scoliosis treatment options and schedule your initial consultation. Often have one shoulder blade that is higher than the other and a “rib hump” is prominent. Scoliosis is a very serious condition and spinal curves that progress beyond 40 degrees are often recommended for multiple level spinal fusion surgery. While scoliosis surgery has improved over the past several decades, choosing surgery is never easy, and many patients find that the risks and poor treatment outcomes make this a last resort. Patients often experience chronic pain and headaches, loss of balance, and digestive disorders. Clothes hang unevenly and severe postural imbalances are noticed, including a “rib hump” and off-centered belly button. Many times the spine is visualized as a “C” or “S” shape. Many patients struggle with poor body image, social anxiety, and depression. The CLEAR™ Institute has done exclusive research and development into new and better treatment methods for treating severe scoliosis. Specialized rehabilitation equipment, custom treatment plans and protocols, and scientific breakthroughs in the field of bio-vibration have been created for the specific purpose of providing patients with a better treatment alternative for curves above forty degrees. Speak to one of our Team Members at 305-705-0777 to learn more about severe scoliosis treatment options and schedule your initial consultation.